Luggage rack. If you don’t have one, it is nice to have a place for them to put their luggage, even if it is a short stool or ottoman. Extra towels. Fresh towels in the bathroom, but also provide a set of extra towels in the bedroom. Toiletries. Although most guests bring their own toiletries, it is nice to have some extra in case they forgot something like a blowdryer. Places to visit. Provide your address and a list of local shops, markets, and events you think your guest may enjoy during their stay. Sheet spray. 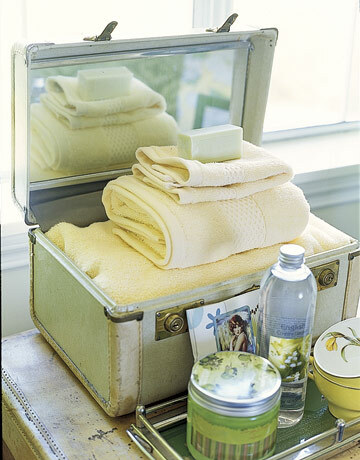 Provide a relaxing scent by spritzing lavender sheet spray on the linen. Alarm clock. Don’t want to miss a flight or an appointment. Water and glass. A small glass pitcher or carafe is great so the guest won’t have to go in the kitchen for a quick drink. Stationary. Even postcards are nice to have around for them to send letters home. Mirrors. Preferably a full length one. Oh if only I could hire you to get my life all spiffed up!